Product team anti-patterns easily (and repeatedly) slip into the fast paced day-to-day of startups and large organizations. 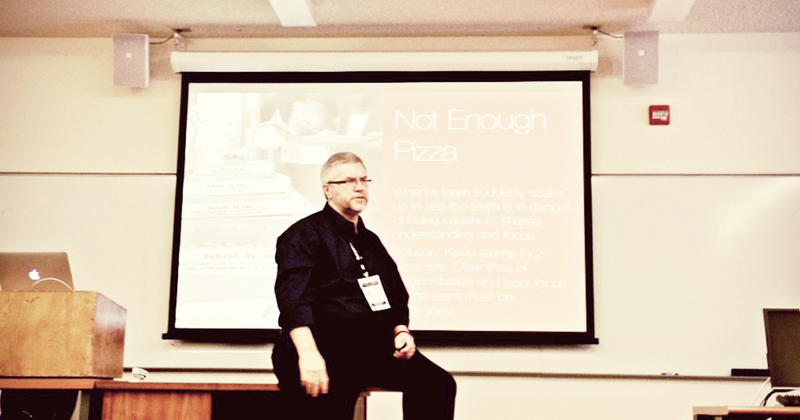 I was fortunate enough to see Bill Scott of PayPal speaking at Silicon Valley Code Camp. He shared a number of amazing lessons learned on how to create great products. Here are six anti-patterns that Bill suggests your product team should avoid to move fast and keep shipping effectively. There’s nothing wrong with ironing out all of the errors and UI kinks in a project— in other words doing something until it’s perfect. But, while bringing something to perfection, it’s absolutely critical that you try to keep an eye on continuously delivering your changes. 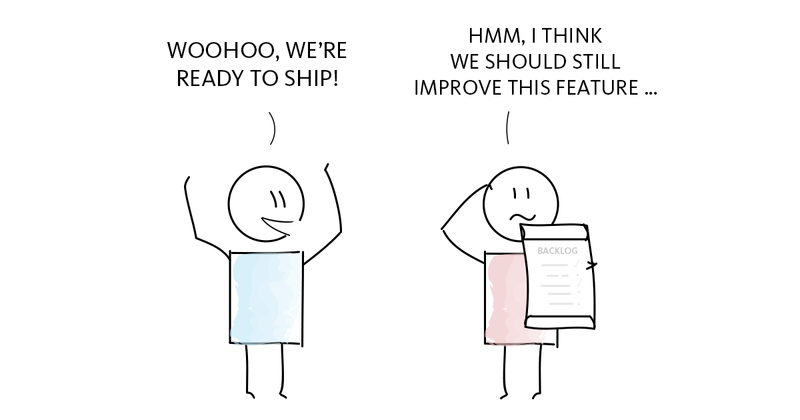 You don’t have to ship a completely perfect feature at a time — what for? Just imagine yourself building something until it’s perfect. You spend hours, months, even years developing your product, not showing it to anyone. It’s because you don’t want to disappoint people with something that’s lacking features. After getting it out to your customers you realize that they either don’t understand it the way you hoped they would or don’t need it (anymore) because in the time that has passed, the market has changed. Instead of having a bad experience, like above, try shipping in smaller bits and steps. Just make sure that those simple bits work to a point that people can try it. You’ll get feedback earlier and you might become aware of things you haven’t thought of to begin with. Don’t be afraid that people might not like what you’ve made. The most important thing is that you get your ideas out to your customers and validate your assumptions as early as possible. The earlier you get feedback, the quicker you can pivot your initial idea with less effort and ultimately prevent your team from building something in the wrong direction. Depending your appetite, that usually makes teams range from 5 to 7 people. 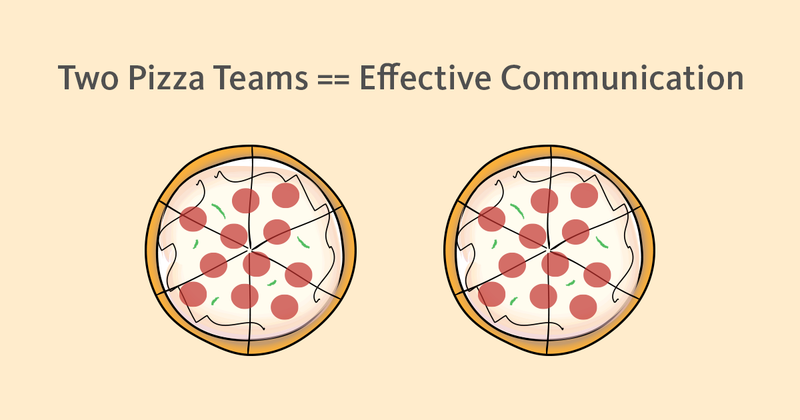 The term two-pizza team was originally coined by Amazon’s CEO Jeff Bezos while he transformed the company’s product teams into small, autonomous, cross-functional, working task-forces. Focus, communication, commitment, responsibility and self-coordination. All those principles become effective throughout each team member in smaller teams. You can read more about Amazon’s two-pizza teams in this FastCompany article. Bill Scott on Product Team Anti-Patterns at Silicon Valley Code Camp. 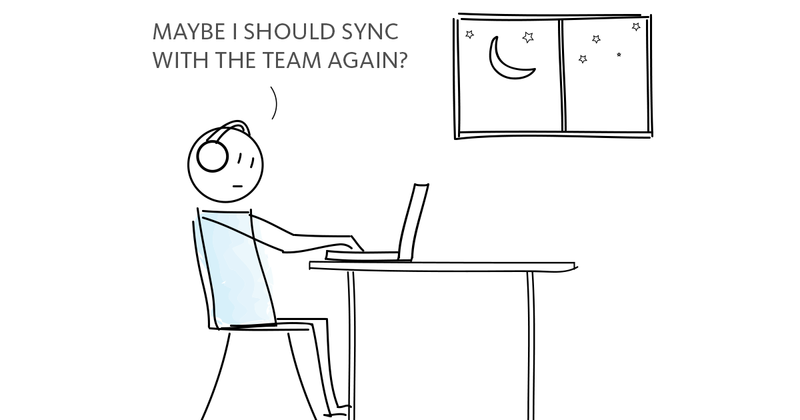 Communication between distributed team members can be a real challenge. If you have to work remotely, email collaboration is usually not the best way to be productive. 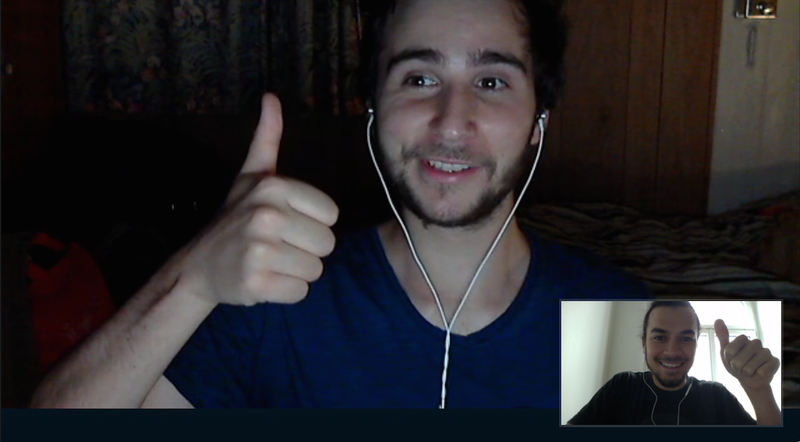 Chatting and making Skype- or phone calls already improve communication. But the most effective and best way for remote teams to communicate is still a video call (Hangouts, Speak.io) where both ends focus on the conversation and try to look into each other’s virtual eyes. Just last week, somebody told me that they’re doing video calls regularly. They went on to say if the person they’re talking to makes eye contact while speaking, it feels like a real conversation. Here, the focus is strong and there is almost no loss of information. Bill really inspired me by saying he’s applying the principles of lean into PayPal’s enterprise environment. He started to work on one pilot project with a cross-functional team, applying new habits and principles, then went on with the next team for the next project and so on. Slowly but surely lean thinking and the culture of the lean methodology was understood and adopted, with advantages being uncovered as teams find their own rhythm of development. Especially in complex and settled environments, start with a pilot, learn and iterate. For example, if one member of a team is working 5 days in a row on their own, shutting down to focus on their own tasks, collaboration with the team will obviously not be as intense as it could be if that team member was to exchange thoughts in shorter and regular intervals. Communication and knowledge sharing is key for a good playing team. Lack of communication can lead to team members doing things twice or leaves them unaware of product changes that might happen while working without communicating with the rest of the team. Further, big chunks of work are already wired too complex to fix without much effort. 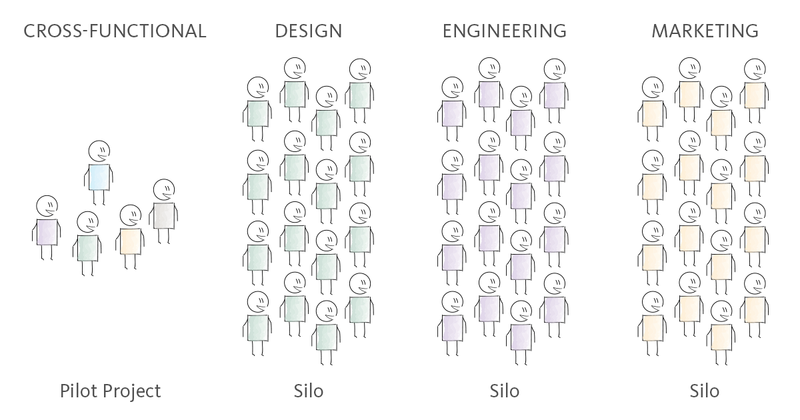 A healthy communication culture is crucial for (remote) product teams to stay in sync. Without it, it’s impossible to react to sudden changes or to go after new opportunities. Regular Stand-Up Meetings can help a lot with that. If you are the type of person who is really visionary about future implementations, or features in your project or product, you know that your stream of ideas is never-ending. When it then comes to the point to share the idea with your team and there is someone who brings up half a dozen reasons that your ideas are not convertible or simply far-fetched, it seriously decreases your and the whole team’s productivity. Assuming that your ideas will be vaporized by the naysayer in any case, it narrows down your motivation to share them. A reason for the naysayer’s reaction might be, at first sight the idea could be too overwhelming from their point of view. 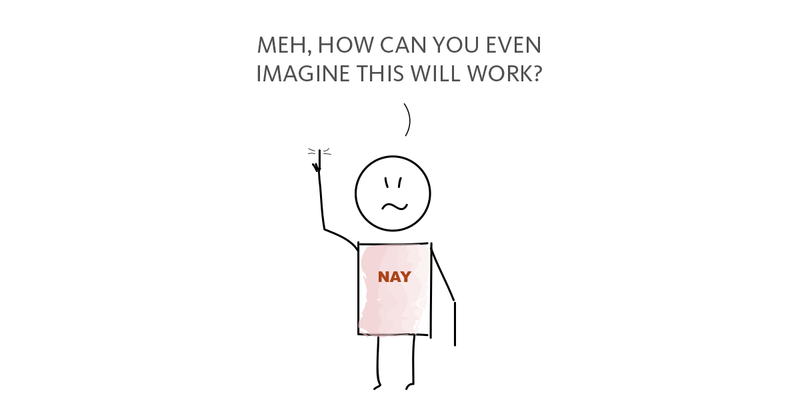 Breaking down the process into smaller steps, and explaining why that feature is important could be an approach to put everyone on the same page, naysayer included. The covert aim is to encourage each team member to be innovative and to come up with great individual ideas that eventually get implemented into the product. In general, talking about the company culture regularly with the whole team empowers, connects and helps a lot to understand the reason why and how features are being implemented. Have you made an experience based upon one of the topics mentioned above? 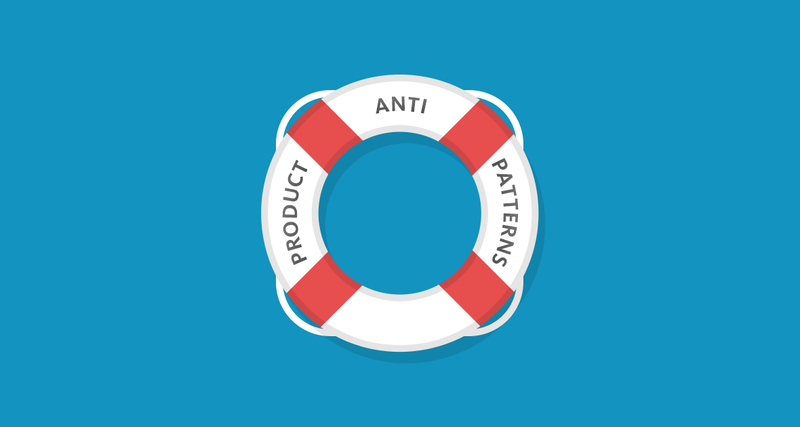 Do you know some team productivity anti-patterns everybody should be aware of? I’d love to hear your opinion in the comments! If you’d like to automatically receive new posts that are all about product, subscribe here to get them via email. Allan Berger is Co-Founder & COO at Blossom. He is focused on the lean startup approach, providing a smooth user experience and design. Say hi to Allan.